With cooler weather on the way, now is the time to think about fall maintenance. Many homeowners make the mistake of waiting until the last minute to get their heat pump or furnace ready for the heating season. Getting your heating system ready for winter now can save you plenty of headaches later. The surest way to nip any problems in the bud is scheduling your annual heat pump or furnace tune-up. 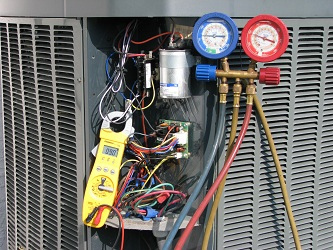 Our HVAC-system professional will thoroughly inspect your system, clean all the parts and make sure the connections are tight and the wiring is sound. This inspection will allow your technician to catch any developing problems and correct them immediately. So when it’s time to turn the heat on, you can count on it. That service call also gives you the opportunity to discuss any questions or concerns. It’s an ideal time, for example, to ask your technician about the air filter–what kind he recommends for your unit and how often it should be checked. A ductwork check isn’t automatically included in your tune-up, but you can ask for one. Your technician will be able to locate any rips, tears or loose connections and seal them. You’ll be assured of tight ducts that can deliver all the warm air that you need. You’ll be assured of healthier air quality, as well, because duct leaks can allow contaminants to enter your air stream. If your ducts run in spaces where you have combustion equipment, sealing any leaks will also keep any carbon monoxide out of the air in your home. At the same time you’re tending to your heating system, consider DIY projects that can help your system do its job. Seal the air leaks in your home. Check door and window frames, as well as spots where wiring, cable and plumbing come into your home. This is a good time to boost your insulation, paying special attention to the attic. Hughes Air Heating & Cooling can put you on the right track when it comes to fall maintenance. Contact us for all your heating needs. We serve homeowners in the North and East metropolitan Phoenix area.